James Wan has broken his silence on The Trench project. Earlier this week, it was revealed that Warner Bros. is reportedly looking to make the Aquaman spin-off with Wan on board as producer. The Trench are briefly shown in the Arthur Curry standalone movie and they're pretty terrifying. 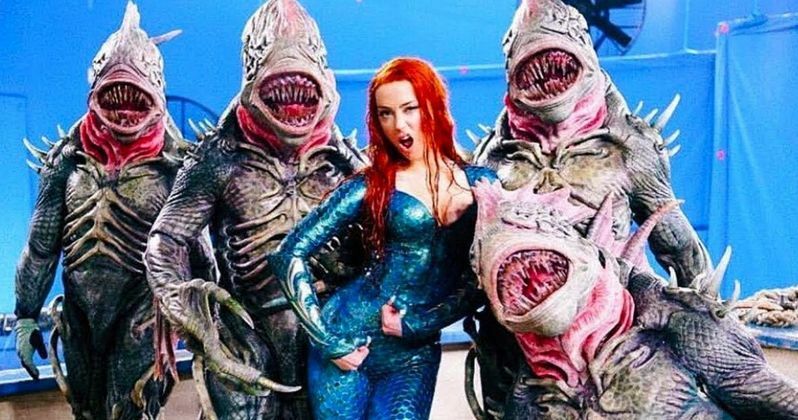 It is believed that the project will be in the horror realm, and based off of the box office success of Aquaman, it stands a chance to be pretty big with horror and DC fans that are looking for something new from the studio. Before showing up on the big screen in Aquaman, The Trench were first introduced in 2011 as a part of DC's New 52 relaunch and were created by Geoff Johns. They were originally part of the kingdom of Atlantis but when it sunk, the population who were cut off from survivors later evolved into hideous monsters. It already seems like something that James Wan would be interested in tackling with his experience with The Conjuring and Saw franchises. James Wan had this to say about the movie on social media. "During the early stages of preproduction, I fell in love with The Trench and its designs... and secretly hoped to explore this world further/more. (Now, I'm not confirming or denying this project ;)"
Warner Bros. and DC Films have brought Noah Gardner and Aidan Fitzgerald on board to write the horror-tinged script for The Trench. With the movie in such early development, it's hard to say when we all might get to see it hit theaters. In addition to James Wan, Peter Safran is reportedly on board to produce. With Wan not confirming or denying the project leads one to believe that much like Aquaman 2, he's waiting to see a good script before deciding to put his name on it. Even with The Trench in development, there is no guarantee that the movie will make it the big screen. However, the project seems very interesting and could see some horror fans checking out the DC universe. Let's hope that everything runs smoothly with the script and that James Wan ends up producing the project when all is said and done. This story is developing and more news is expected to drop soon. Check out James Wan's Twitter account for his thoughts on The Trench.